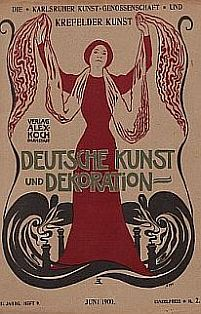 Deutsche Kunst und Dekoration was founded, edited and published by Alexander (Alex) Koch (1860-1939). It is sometime known as “the German Studio”, and was launched four years after its British counterpart. It is similar, both in size and format, to The Studio, and like its predecessor, primarily covers contemporary decorative and fine art. In addition to well-illustrated articles it also includes book and exhibition reviews and news items. Although international in its scope, Deutsche Kunst und Dekoration predominantly covered German, Austrian, Scandinavian and Central European art. It contained extensive reports on the Exposition Universelle et Industrielle in Paris in 1900, the Esposizione Internazionale d’Arte Decorativa Moderna held in Turin in 1902, and the work of the Wiener Werkstätte and by members of the Deutscher Werkbund.